Welcome to Day #9 of South American Chocolate Theme Weeks. 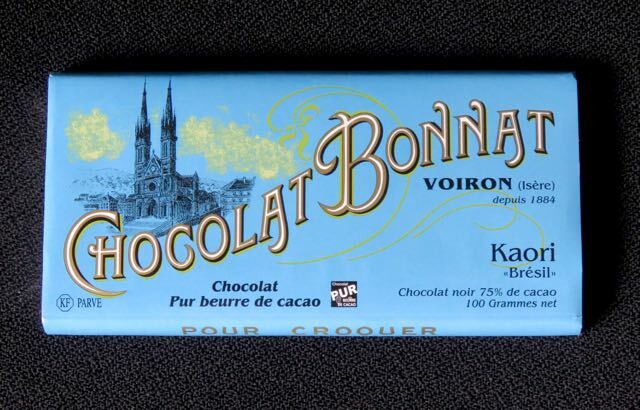 Today's Kaori* Bresil Chocolat Noir (Dark Chocolate) 75% bar was from Chocolat Bonnat (Voiron, France). Bonnat bars featured in the past have all had a creamy, buttery melt and texture, and this three ingredient bar (cocoa, cocoa butter and sugar) was no exception. The chocolate had a hint of slightly green (light/bright green foliage, green tea), almost floral aroma; and it had uniform, "soft and sunny" smooth authentic chocolate flavor. *Kaori is the name of a Japanese family that cultivates cacao in Brazil. In Japanese the name means scent or fragrance, and can also refer to fabric weaving. This definition may not be directly related to today's bar, but it fits.